All year long, the focus was on the Federal Reserve. Coming into 2017, bond investors were concerned about the capital markets ability to digest additional rate hikes and were not convinced the economy was strong enough to withstand them. Over the course of the year, the Federal Reserve tested the markets by raising interest rates three times, taking the Federal Funds Rate to 1.5%. We anticipated the bond markets to be able to handle gradual rate hikes that were telegraphed and that held true in 2017. U.S. bonds returned 3.5% and global bonds earned 2.06%. In addition to the rate hikes, the Federal Reserve laid out a plan to reduce their balance sheet in a very methodical manner over the next few years. With gradual tightening of monetary policy to be continued in 2018, we expect some pressure to be applied to bond yields. 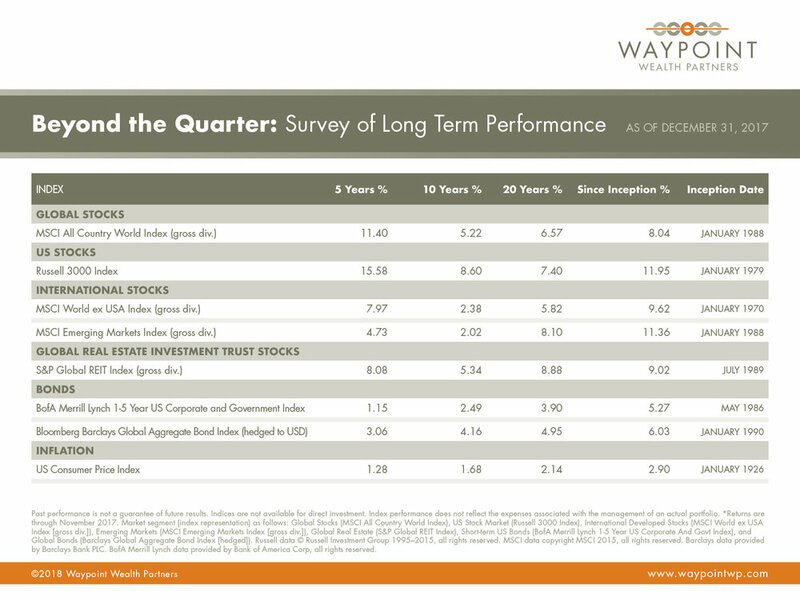 We remain underweight duration (sensitivity to interest rates) and continue to own high quality bonds. 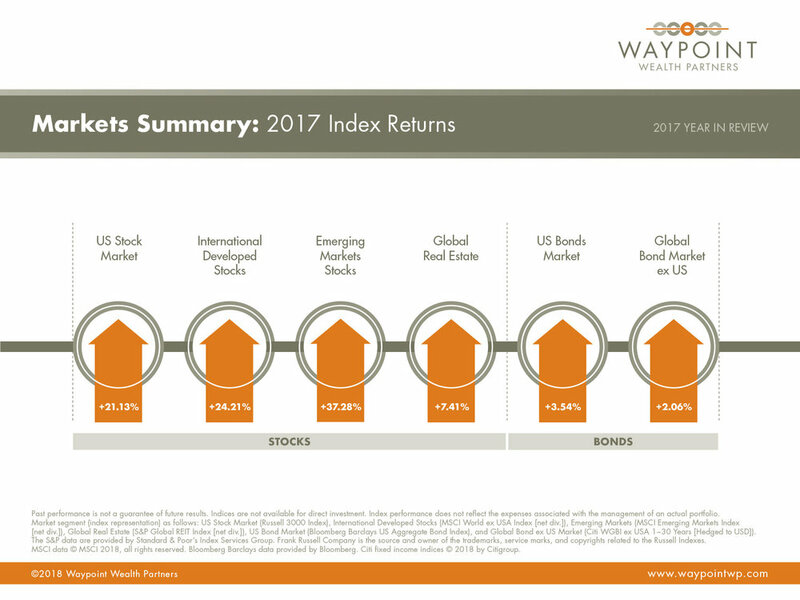 Stock markets across the globe achieved stellar results with above average returns and below average volatility. Leading the charge was emerging markets, returning an impressive 37.28%. Stabilized commodity prices, better than expected growth out of China, and a weaker dollar fueled a rebound in earnings for emerging market companies. We continue to favor the long-term prospects of emerging markets and maintain an overweight to the region in our portfolios. International stocks also had a strong showing, earning 24.21%. Developed market equities benefitted from central bank policy with the Bank of Japan and European Central Bank continuing to provide loose monetary conditions. 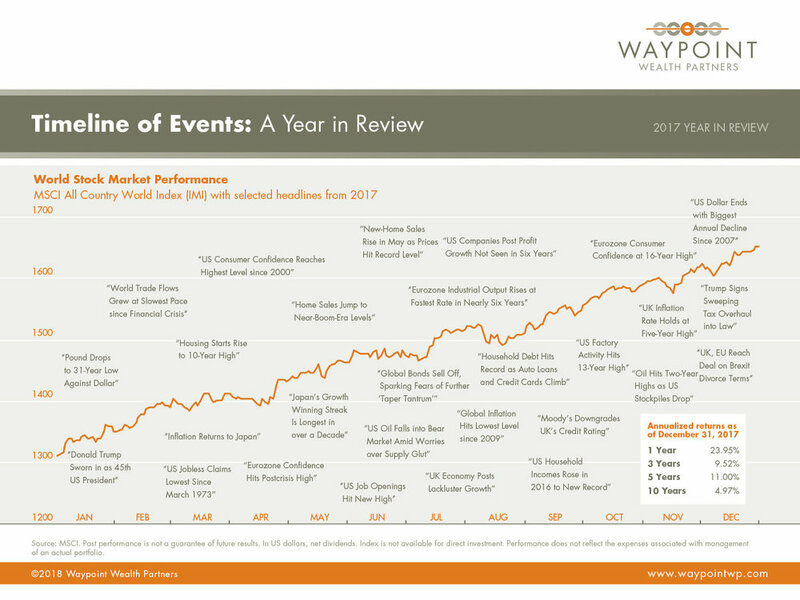 U.S. markets had another great year, delivering 21.13% and extending the current bull market to nearly nine years. The consistency of returns and lack of volatility was remarkable for domestic stocks. S&P 500 delivered positive returns every month in 2017 and did not have a drawdown of greater than 5% all year. We acknowledge that valuations in the U.S. are high, but valuations can remain elevated for years and valuations alone do not cause bear markets. The U.S. stock market has four major factors supporting the levels today: low interest rates, low inflation, fiscal stimulus (tax reform), and strong earnings. Global economies had the best period of synchronized, above-trend growth in almost a decade. The U.S. economic expansion extended its streak to 102 months and unemployment rate fell to 4.1%. Wage growth continues to be flat, but with a faster growing economy and tighter labor conditions, we expect wage growth to make up some ground. Leading economic indicators we track signal no sign of immediate recession and most indicators are at or near all-time highs (a positive thing). Eurozone experienced better than expected economic growth with unemployment rate falling to 8.8% from a high of 12.1% and increased credit demand from consumers. The accommodative monetary policies across the globe are largely responsible for the pickup in growth and higher asset prices we have enjoyed post-recession. Economic growth and inflation measures will be key going forward. An overheated economy and higher than expected inflation could cause central banks to abruptly tighten monetary policy, which could derail the momentum we currently enjoy. No one knows what the future will hold, but investors should appreciate what we have today – an economic environment that is almost as good as it gets. The financial media is drawn to catchphrases, acronyms, and buzzwords that can be sold as the new thing. FAANG (Facebook, Apple, Amazon, Netflix, and Google) is the latest of these. But does this constitute an investment strategy? For journalists, commentators, and marketers, acronyms like FAANG are useful. They fit easily into headlines and they appeal to a feeling among some investors that their portfolios should match the “zeitgeist” or spirit of the age. But as we’ll see, investment trends tend to come and go. This is not to downplay the transformative nature of new technologies and the possibilities they present. But as an investor, it is wise to recall that all those hopes and expectations are already built into prices. Such is the public interest in the tech giants that the parent company of the New York Stock Exchange recently launched the NYSE FANG+TM Index that includes the quarterly futures contracts of the FAANG members apart from Apple (hence only one “A”), plus another five actively traded technology growth stocks. So, does this mean, as some media gurus suggest, that you should reweight your portfolio around these tech names? After all, these companies have fundamentally reshaped traditional sectors like newspapers, television, advertising, music, and retailing. For investors, there are a few ways of answering that question, none of which involve denying the significant influence Facebook, Amazon, Apple, Netflix, Google, and other technology names are having on our lives. Firstly, market leadership is constantly changing based on a myriad of influences, including shifts in the structure of the global economy, commodities, technology, demographics, consumer tastes, and supply factors. Trying to build an investment strategy by anticipating these forces is like trying to catch lightning in a bottle. In the 1960s, the then often-quoted Nifty Fifty of solid, buy-and-hold blue-chips included such names as Xerox, Eastman Kodak, IBM, and Polaroid, all of which were disrupted in one way or another by newer, more nimble competitors in the following decades. By the late 1990s, the media was full of stories about the dot‑coms, companies that were building new businesses using the transformative power of the internet. A handful of those companies (Amazon, for instance) fulfilled their promise. Many others (retailer Boo.com, prototype social network TheGlobe.com, and pet supplies firm Pets.com were just three examples) crashed and burned. In the mid-2000s, the focus turned to companies with a large exposure to the so-called BRIC economies, an acronym based on the fast-growing emerging economies of Brazil, Russia, India, and China. Several financial services companies even set up BRIC products, with mixed degrees of success. One investment bank, having argued that the superior growth for emerging economies justified a bias to stocks exposed to these markets, ending up closing its BRIC fund in late 2015 after years of poor returns. So, while individual sectors each can have their time in the sun, it is not clear that weighting your portfolio toward an industry currently in favor is a sustainable long-term strategy. A second way of looking at this issue is that accepting it is difficult to pick winning sectors does not mean you should exclude these zeitgeist stocks in a diversified marketwide portfolio. You can still own them, but you do so by casting a much wider net. The more concentrated the portfolio, the more you are exposed to idiosyncratic forces related to individual stocks or sectors. Being highly diversified means you can still benefit from the broad trends driving technology or whatever is leading the market at any one time, but you are doing so in a more prudent manner. only reducing the risk of placing too much of a bet on one sector, you are improving the odds of holding the best performers. We’ve seen that even professional investors can find it tough to pick which sector will lead the market from year to year. It’s true that technology companies like Amazon and Facebook have performed well recently. But it is worth recalling that current prices already contain future expectations about those companies. We don’t know what future prices will be because these will reflect information we haven’t received yet. Because no one has a reliable crystal ball, a better approach is to diversify. That way we increase the odds of being positioned in the next big winning sector without chasing hot trends or latching on to cute‑sounding acronyms. DISCLAIMER: Adapted from “Catchphrase Investing” on Dimensional’s website, November, 2017. Dimensional Fund Advisors LP (“Dimensional”) is an investment advisor registered with the Securities and Exchange Commission. Diversification does not eliminate the risk of market loss. There is no guarantee investment strategies will be successful. Past performance is no guarantee of future results. All expressions of opinion are subject to change without notice in reaction to shifting market conditions. This content is provided for informational purposes, and it is not to be construed as an offer, solicitation, recommendation, or endorsement of any particular security, products, or services. Older PostTo Bit or Not to Bit: What Should Investors Make of Bitcoin Mania?